These pretty shamrocks are easy to make from a streamer of green crepe paper – you can often find these streamers, in all sorts of colors, in the party decorations section of the dollar store. One paper streamer will be enough for a classroom of children to make shamrocks to take home for St. Patrick’s Day. These also make great little smile-makers for adults to hand out to their friends or co-workers. 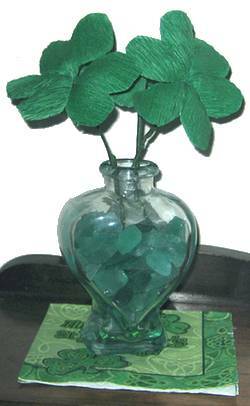 You can either make the shamrock with a stem long enough to put in a small vase, or shorten it to make a buttonhole shamrock. 1. 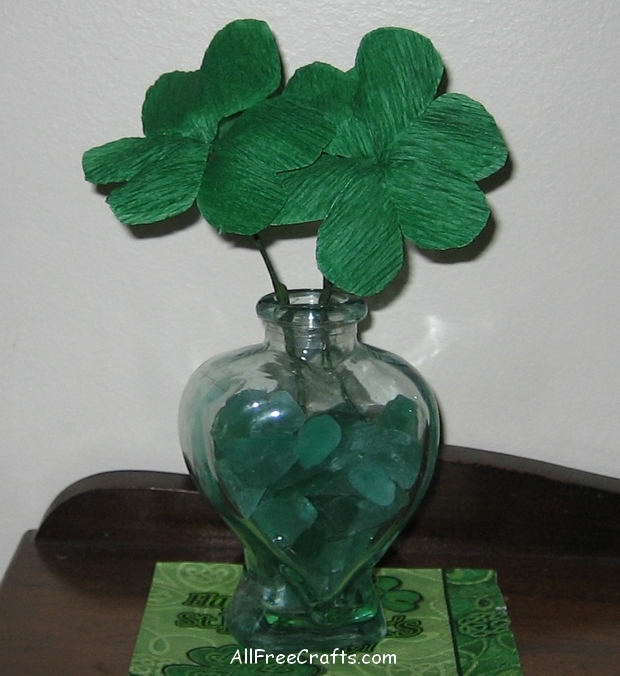 You need to cut three matching pairs of petals for each shamrock. Do this by first taking a 12 inch length of crepe paper and folding it, accordian-style, into three 2-inch folds, as shown in our diagram. You should end up with six layers, all about two inches long. 2. Hold all the layers together and fold the left half over to the right along the center line. In other words, fold down the middle. 3. If you are doing this for the first time, keep the fold to the left side, and draw half a heart shape, with a short stem at the bottom, similar to the one shown on our diagram on the top layer of crepe paper. If you have already made a few shamrocks, you might be able to skip this step. 4. Cut out half a heart shape, being careful to start the bottom of the heart with a short stem piece. When you are finished cutting you should be able to unfold and separate the crepe paper layers into three pairs of matching shamrock petals. 5. Take one pair of petals and separate them. Take one wire stem, or one chenille stem, and apply glue to the top inch or so. Place the glued end of the stem right down the center line of one of the petals, so that the top of the wire just reaches the top center of the heart and the end of the glued area reaches just to the end of small bottom stem. Place the matching petal on top. Press the two layers down gently but firmly at the center so the glue will hold the stem and the petals in place. Repeat with the remaining pairs of petals, and let the glue dry. 6. Bend each pair of petals down from just above the small stem, then hold the three wire stems together and arrange them into the final shamrock shape. Begin winding green floral tape around all three wires, taking the tape up to and around the small stem at the bottom of the shamrock petals. Wind the tape down again until the wires are totally covered in tape and firmly secure. Finally, if the shamrock appears too flat, take advantage of the special qualities of crepe paper which make it so useful for making paper flowers. By very gently pinching and stretching the crepe paper with your fingertips, you can put a slight upward curve on each pair of petals.